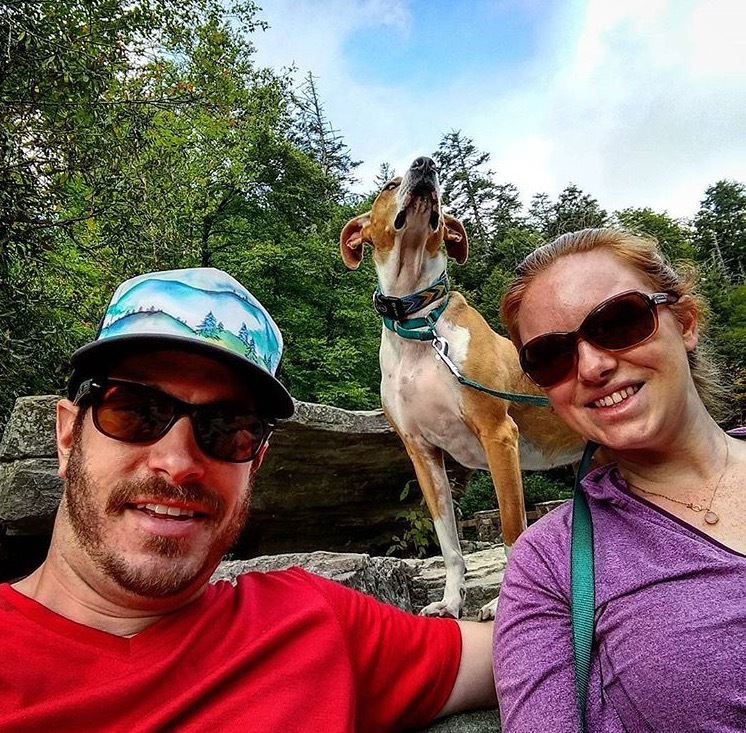 For the thirtieth installment in our ongoing interview series here at Dirt Orcas, we are very pleased to share the story of Michael and Leslie Barber, and #FrankieTheTrailDog. You may know them as the crew from Broken Spoke Overland (now LOST IN CAMP). 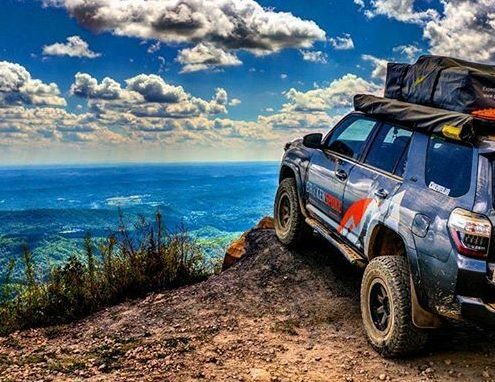 Their overland adventures in their Toyota 4Runner are worth checking out, as they are always inspiring and fun. 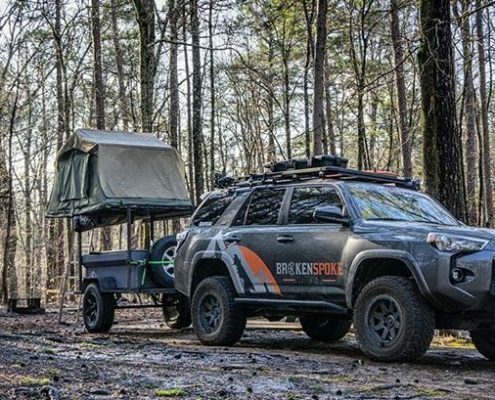 I discovered Lost in Camp through Instagram (you can view their account here) and they fall in with a group of some other Trailer / 4Runner overlanders we have interviewed, Lifestyle Overland and Swellrunner. 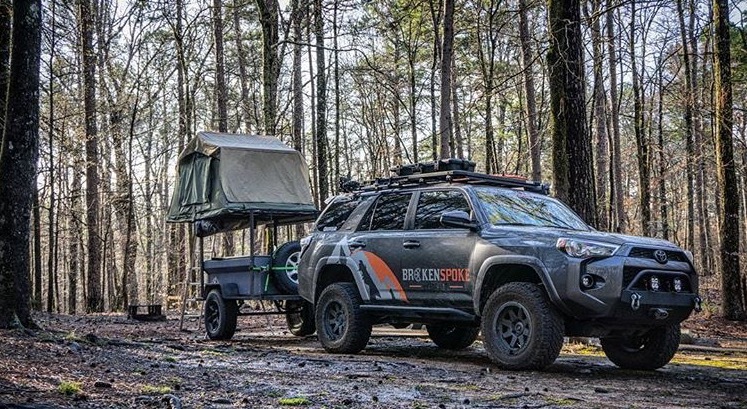 You can view the Broken Spoke Overland Youtube and like the Facebook page and of course check out their website to learn even more about them and follow their ongoing adventures, but obviously start here and read our interview below. 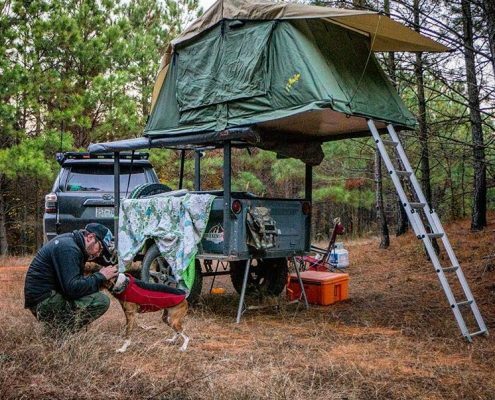 Michael, Leslie and #Frankiethetraildog are a solid crew, who follow their passion for overland travel and the outdoors with vigor. They are great reminders that organizing your time to fit in the important things in life is paramount. I’ve always had a passion for vehicles and different modes of transportation. Right now, I am an engineer working in the automotive manufacturing industry. My main focus is process improvement and cost reduction. It’s an interesting beast, especially when you have such an interest in the finished product. 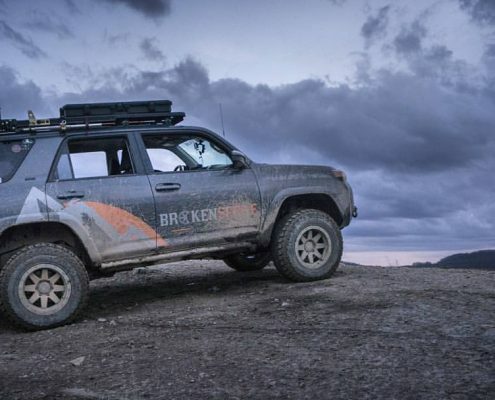 The Broken Spoke Overland rig is a 2015 Toyota 4Runner SR5. Yep that’s right, just the base model. And we lovingly call her Riley. There’s a naming scheme to all the vehicles I’ve ever owned. Has to start with the first letter of the model or make and must end with a hard “E” sound. We also picked up and finished a custom built ultralight offroad travel trailer that features a Dinoot fiberglass M-series tub and a frame originally constructed using the material from a Harbor Freight trailer kit. 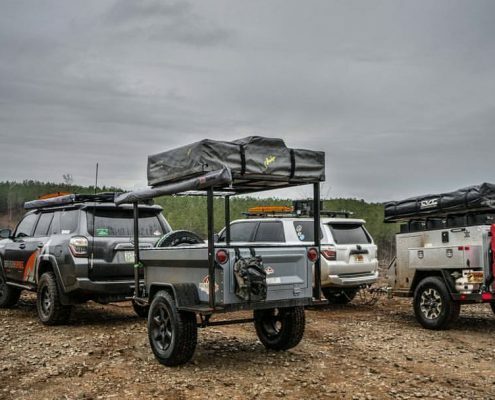 The original trailer was built by the fine guys at Apex Overland, and then we finished it out with a few necessary additions like a Lock-n-Roll hitch and some much needed shocks. In 2014 I owned a not even 10 month old Subaru Outback that we were having oil burn issue with. I didn’t like the fix that Subaru was proposing and just wanted to go back to the reliability of a Toyota. This was especially true after the slewed run of plagued vehicles I have had since owning my first car. 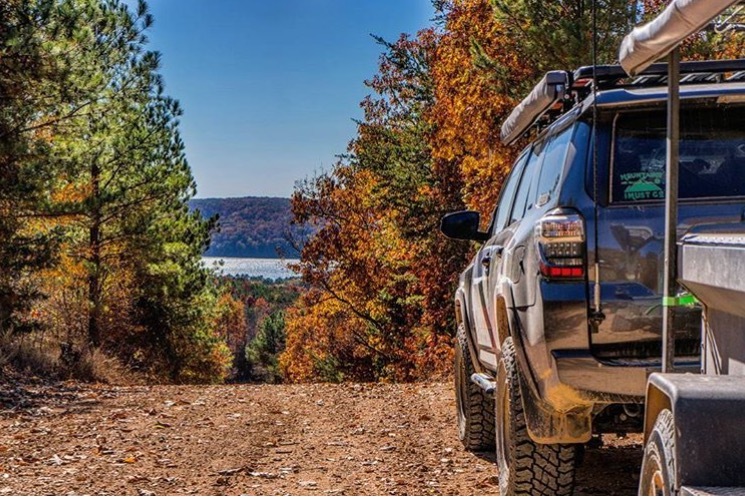 In the fall of 2014, just after Thanksgiving, we traded in the Subaru and picked out our 4Runner. 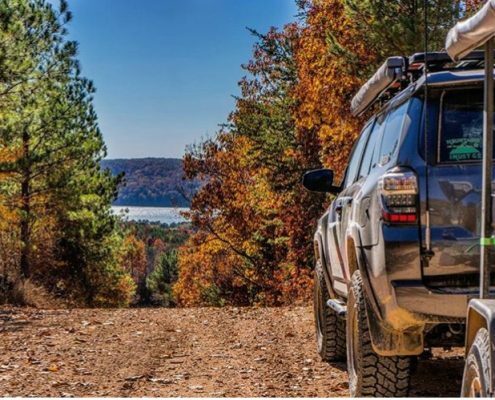 I was initially looking for a used 4th Gen 4Runner, but with them holding their values so well on the secondary market, it just made sense to look at new vehicles. 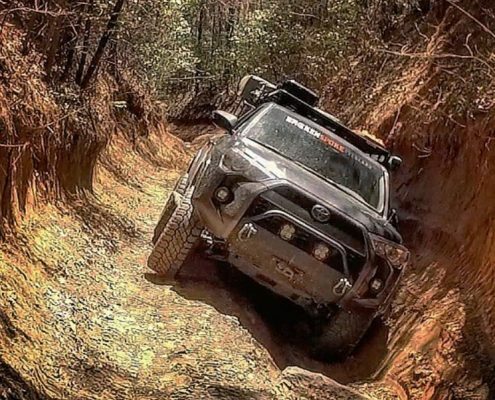 The only other vehicle that I even considered at that point was a new 2nd Gen Tacoma. I already had a 94’ T100 long bed sitting in the driveway as a work truck, so it just made more sense to get the 4Runner. I don’t think I could get away with leaving anything I buy “stock”. I did, however, keep it stock for the first year of ownership. Well, that might be a slight little white lie. I swapped the original OEM highway tread tires for some Cooper ATs in the first 1000 miles. Since that one year mark I have done a whole laundry list of modifications to the rig. Some even twice or three times. 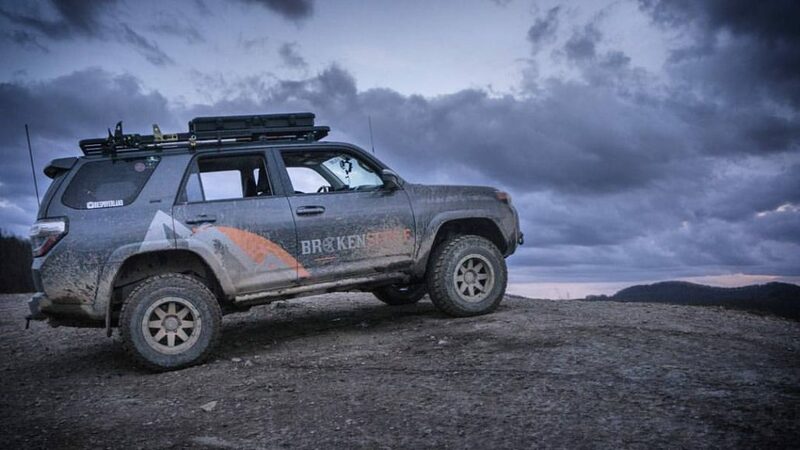 A complete list of the current modifications to our 4Runner can be found on our website at http://brokenspokeoverland.com/riley/ . The short of it is we’ve added a suspension lift, larger tires, sliders, a front bumper with winch, some additional lighting, and my favorite of all an ARB Fridge. As much as I love modifying the vehicle. The main goal is to get us out there exploring in nature. I would say we live out of our vehicle, at most, in short spurts. Usually a long weekend up to a couple weeks. 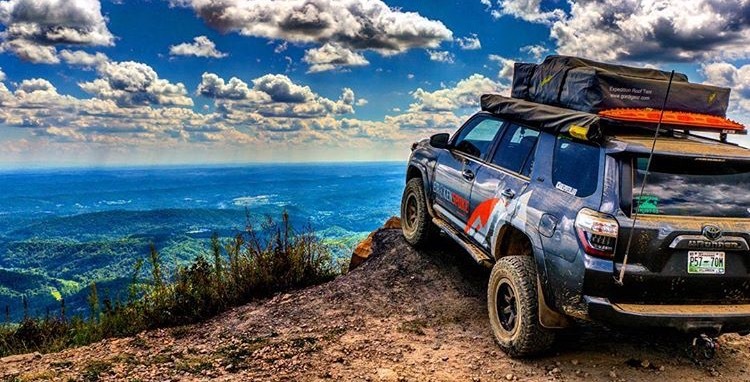 Our favorite part of the time spent in our vehicle is just the ability to disconnect from the world and enjoy the beauties that Mother Nature has put out there for us. We miss so much in our busy day to day lives, that for us, it’s required to slow down and enjoy being outside away from everything. 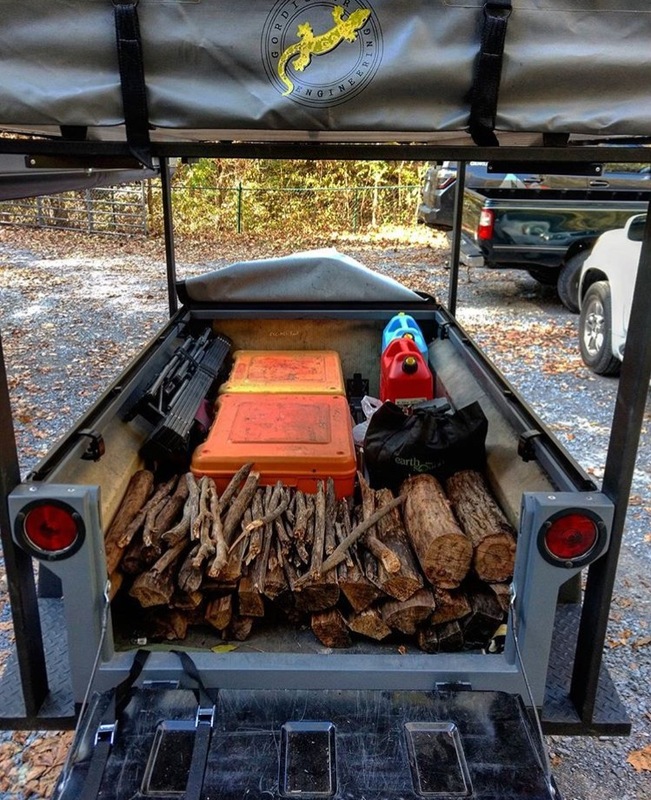 The RTT (Roof Top Tent) and trailer is great for our style of travel which is usually up to a couple weeks. If we wanted to venture into longer trips I would want something fully enclosed with a shower. You just can’t beat a soothing shower at the end of a long day on the trails. We usually accomplish this in creeks, streams and lakes though. How many miles have you put on your truck? She’s sitting just over 30,000 miles as of this interview. Those are mostly all adventure miles because I don’t have to travel far for work. And those times I do, modes of transportation are provided. Leslie and I both agree. So far our favorite spot we’ve discovered is the place we call “The 360* Spot”. We found it while on our Kentucky Adventure Tour trip last summer. It’s a location that is up on top of an old strip mine in Eastern Kentucky. Better known as Coal Country. But when you stop, you can stand and see 360 degrees around you. One of those picturesque moments. There definitely isn’t, and I’m sure there will be many many more added to our list after our big trip this summer! Right now we are planning an amazing two week trip through New Mexico and Colorado. Not sure we’ll want to come back after that one. Do I have to pick one? I’m not sure I can. My favorite are the ones that lead us deep into the backcountry. Taking us away from cell phone reception. To places where natural beauty is still mostly untouched by humans or reclaimed by nature. We just love getting away! “Preparedness.” I’ve always been one to try and plan out my life as far as I could see. But I see that changing quite a bit lately. I’m still using that same skill of being prepared, but in a different sense. In the way that allows you to be prepared for the ever changing. To be able to adapt to the situations around you. 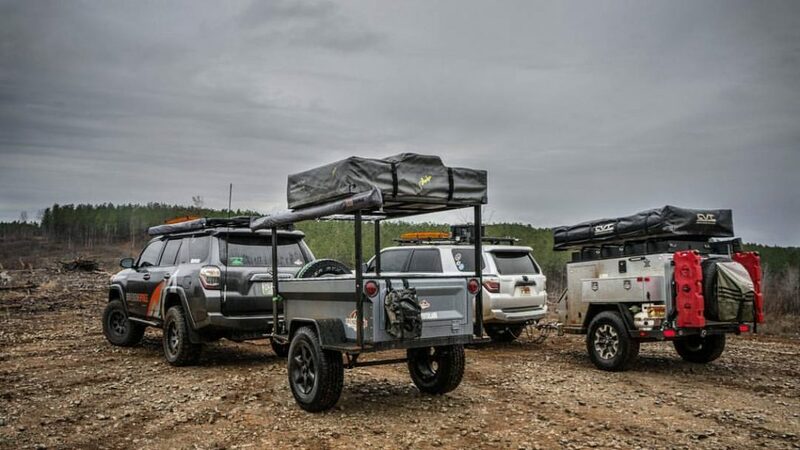 This is essential in the world of Overlanding. 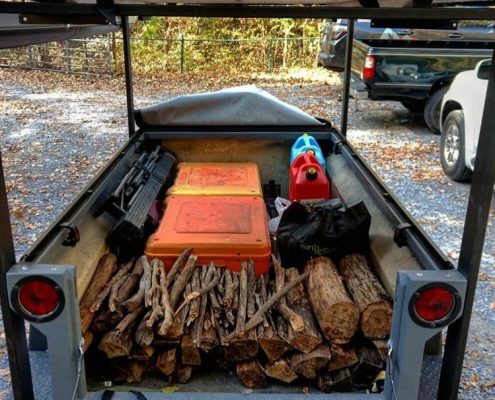 If you could give a person one piece of advice when thinking about living out of a vehicle what would you tell them? Can I give them three? Organize! Organize! Organize! You have to find a system that works for you in how all of your gear is stored and accessed. Being able to find what you’re looking for when you need it can be critical. 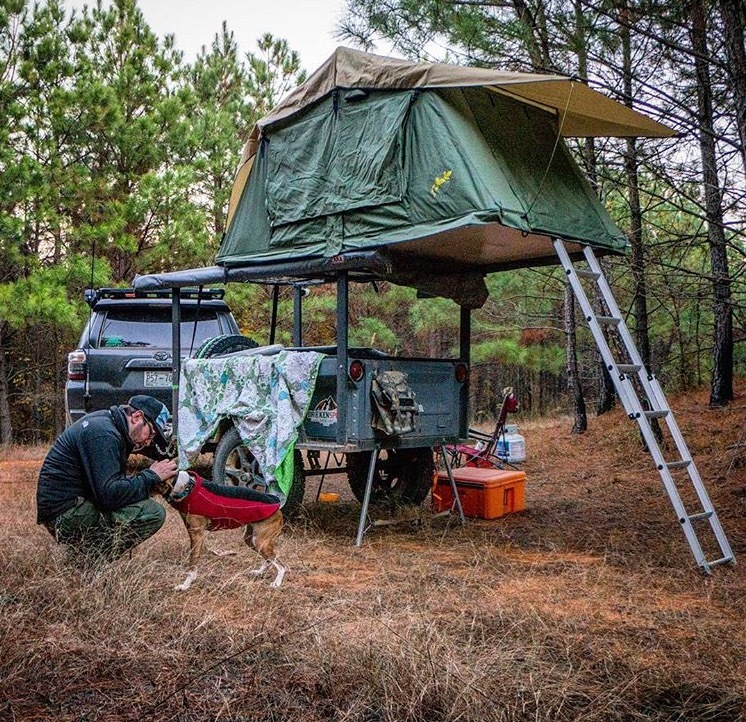 You also don’t want to spend all your time looking for items when you could be relaxing at camp, getting that next stunning photo, or making miles on the trail. Remember everything has a place and everything in its place. This comes mostly from my need to be organized but also from my engineering background and I take it as a challenge. I’ve known from a younger age that being outside in nature made me feel much better than sitting behind the glow of a computer screen. Though until you asked this question, I hadn’t really thought of it this way. I don’t think I could consciously say if I have had that defining moment yet or not. I’d have to say I’m still learning and trending towards that mentality. It is this fact that pushes me to get out there and adventure as much as I can. Though I still have a tendency to plan out too much detail. What sites to see, where to camp each night, how many miles of trail need to be run that day. These are situations I’m slowly letting go of because when you set milestones in this fashion you look past everything else in a blur. You’d be amazed what you can find out there that can’t be researched on the internet. That fact alone is why it can still be defined as adventure discovery. For others it may be different, but photography and now videography are two ways I cope with this. They help me slow down, smell the roses and really look at the environment around me. You have found a strong place in the community of overland travelers. What values do you think your home or family instilled in you, that you take on the road? 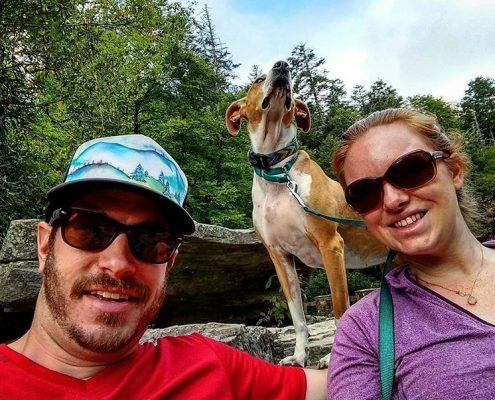 Overlanding is a way to take our family, including the dogs, out of our normal environment and away from the distractions and enjoy time with each other. It is different than going on a typical vacation, every trip we learn more about each other. Our strong and weak points, the things that make us irritated, and the things that make us love each other. 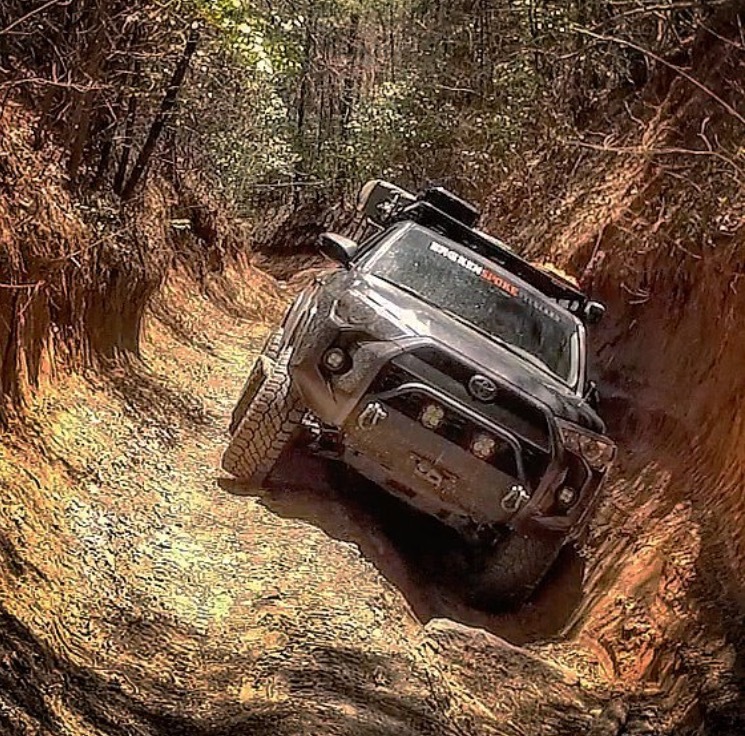 I know I got away from the question at hand here but I really wanted to tell how Overlanding has instilled new values and strengths that we see in each other. We are a much stronger team because of our trials together. West! Ha. We’re actually in the planning stages right now for our big trip this summer. 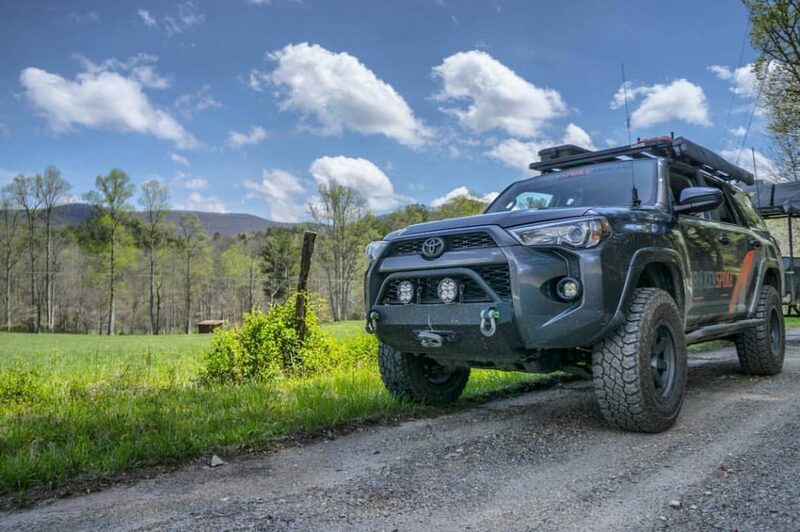 We’ll be taking two weeks to travel offroad through New Mexico and Colorado. Neither of us have had the experience of traveling around the western states and truly seeing what they have to offer outside of the cities. Otherwise, there are quite a few items on our bucket list: Mojave Road, Alaska, and most of Utah including Moab, Joshua Tree, and Canyonlands. The list could easily go on and on. Right now though, if I just want to inspire others to get out there and adventure as well. Doesn’t matter how small your trip is. We all started somewhere. For us maybe one day that will mean making this adventure full time or even planting roots in a place we discovered during our travels.